1. Yale is what we expected Yale to be. The UConn win was no fluke. 2. Harvard is not that good. Losing to Holy Cross, BC and Dartmouth at home just doesn”t work. 3. No team is going undefeated in the Ivies. 4. A three-loss team may casino win the Ivies. 5. Princeton and Columbia will each beat either Yale or Harvard at least once. 6. The home team always has trouble in the Yale-Brown games. So where are we towards the end of January? 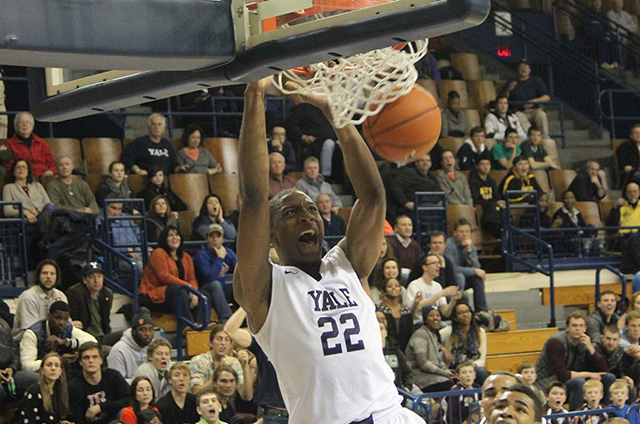 Yale edged Brown at home, 69-65, behind 27 points and nine rebounds by the best player in the Ivies, Justin Sears. At the same time, Dartmouth, who hadn”t beaten Harvard in 11 tries, went on a 26-2 run at Harvard to badly beat the enigmatic Crimson, 70-61. Siyani Chambers had another disappointing game, with only 13 in the loss. Yale-Harvard at Payne Whitney on Feb. 7 won”t involve two undefeated Ivy teams as expected and Yale should be a decided favorite. Who would have believed that in November? Just who or what is Penn basketball? I saw the Dartmouth-Harvard game. It’s true, Harvard isn’t looking like an Ivy champion. Maybe this will be a wake-up call for them: other teams appear to want it more than they do. Not understanding Harvard’s struggles. Appear to be lacking real production from their bench. I thought that Yale’s incoming 2015 class would make them favorites for next year — but that time may be now. While I agree with points #1 and 6 and mostly agree with point #2 (I won’t state that Harvard is not good; just mention that they are not as good as they should be), I don’t know if I can agree with your thoughts #3-5. Yale has been the strongest and most consistent team in the Ivies this entire season. Additionally, its top two players seem to have gotten stronger and more confident as the season has progressed. While an undefeated season is very difficult, this team – from its leaders to role players to coach – seems capable of doing it. After watching Princeton and Columbia over the last few weeks, it is hard to feel confident that they can beat Yale or Harvard. Princeton’s non-conference results were not the most positive. Also, while the Tigers deserved the win over Penn two weeks ago, the Quakers certainly helped them by imploding over the last 10+ minutes. Over the first 25-30 minutes, however, Penn, the #8 team in the league, was outplaying them at Jadwin. In mid-December, I think it was understandable to put Columbia close to the top 2 teams, especially with Lo’s pre-conference play. However, this team appears to be reeling since the end of December. Losses to St. Francis, Stony Brook and Cornell – with two at home – have brought them back to earth. Lo has had three really tough games against Stony Brook and Cornell. The front court has been troubled, and they are not making as many three pointers. In the end, Columbia may still be the #3 team in the Ivies, but that seems based less on its strength than the weakness of teams #4-8. In the pre-season, there was a lot of comments about this being the best top-to-bottom Ivy ever. At this point of the season, the only teams that can truly feel good about its season are Yale and Cornell. A quick btw note to complete the upside-down Ivy Saturday – Penn beat St. Joe’s for a road win at the Palestra. I believe it is the team’s first Big 5 win since 2012. While St. Joe’s certainly does not have a great team this season, it was still Penn’s best win of the season. Win or lose, Penn seems very consistent with its team stats. They have a good 2 point FG%, mediocre 3 point FG%, low numbers of 3 PT made, mediocre FT%, good rebounding, high TO and high fouls. However, in its 5 wins, its opponents have shot poorly, made a low number of three pointers and catch Penn’s TO and Foul bug. I know that Penn is, deservedly, still at the bottom of the Ivy Power Poll. After watching the first few weekends of Ivy League play, however, it is not out of the question that they could get some wins against inconsistent teams that are capable of having a night where they put up some rough offensive numbers. At this moment in time, that seems to include everyone but the Elis – and isn’t that shocking from where most of us thought the Ivies would be earlier this year……. So Much Talk. Talent Wins. There’s a lot of wishful parity talk on this page, both in the comments section and the column itself. You can talk all you want about match-ups and teamwork and momentum, blah blah blah. For all we like to analyze X’s and O’s, basketball usually reverts back to the skills of individual players. Ninety percent of the time in the NBA, the team with the better players wins. It’s a little more random in college, just because the players are more inconsistent (as are the referees). So figure that 80% of the time in college, the team with the better players wins. And the team with the better players is Harvard. By a lot. This season and next season and the season after that are all Harvard’s to lose. No amount of feel-good talk about parity changes that. Give me the better, more athletic players every time. Maybe I would make an exception if the less athletic players were coached by John Thompson III but he’s gone now. Harvard to win.